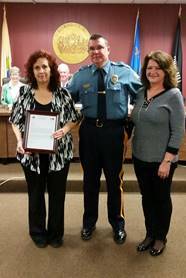 The News Transcript recently did an article about Freehold Borough Crossing Guard Debbie Kane. We could not echo their sentiments more. Debbie has always been committed to protecting her children and has become part of the Freehold Learning Center family. Debbie has gone above and beyond on countless occasions, and we are very grateful for her years of dedication. Congratulations Debbie. The article was well deserved. Debbie is featured in the photo below on the left side of the picture. In the center is Chief Glenn Roberts and on the right is Chief Roberts’ Executive Assistant Monica Sapirstein.